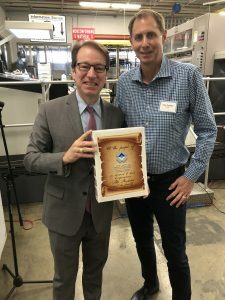 Congressman Peter Roskam (R-IL) visited employees from Artistic Carton Company in Elgin, IL, a premier manufacturer in converting and distributing of folding cartons and a member of the Paper Recycling Coalition. 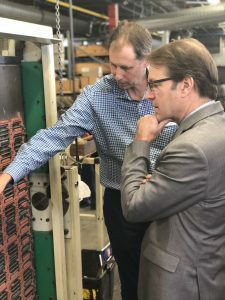 President/Owner Pete Traeger discusses the technology to make folding cartons with Rep. Peter Roskam. The employees at Artistic Carton manufactured a box in Rep. Roskam’s honor. 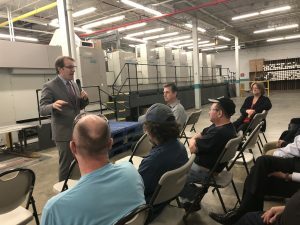 Rep. Roskam shares his views of the economy and future of the U.S. with employees at Artistic Carton.